There are roughly 1 million U.S. citizens living in Mexico. But with warmer weather, cheaper rent, low cost of living, and delicious street food that you can get for a $1, it should hardly be surprising that more and more people are choosing to live south of the border—especially as incomes become increasingly portable. Emily Hatch and her boyfriend, Max, moved to Mexico City from Washington D.C. over two years. She spoke with me about the experience, and explains why she has no regrets. What made you move to Mexico—specifically Mexico City? “We chose Mexico City because there are tons of things to do here. 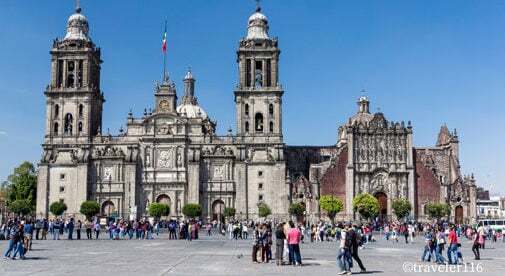 There’s a plethora of museums, historic buildings, Aztec ruins, parks, markets, and malls. We researched a lot prior to moving here and realized we could have a very nice life for our budget. My boyfriend, Max, had visited a few times and loved it. For me though, the first time I stepped foot in Mexico City was the day I moved here. But it didn’t take long for me to settle in and feel comfortable. One of my favorite parts about Mexico City is that there are so many different neighborhoods with different personalities. The first time we walked through Condesa (where we live now) we felt immediately at home. It’s a beautiful neighborhood with tree-lined streets, lush green parks, and a running path that used to be a horse racing track. It’s a bustling neighborhood, with cafés and restaurants on every block, but it’s still extremely laidback. What do you do for work that allowed you to move here? How does your life in Mexico City compare to your life back in D.C.? “Our lives here are much more relaxed. In the U.S., I would wake up at the crack of dawn, work a 10-hour day, then get home and pass out, and do it all again—just to be able to afford rent. I had to track my budget very closely and I rarely indulged in nice dinners or more than a couple of drinks out, in fear of the check. Here, it’s much different. I have more relaxed hours at home, where I spend my time working and hanging out with my dog. “But the best part of living here is that we’ve been able to try so many different restaurants and not feel like we’re blowing our bank accounts. If we go to a nice place and have a couple of cocktails, appetizers, a meal, and dessert, we’ll spend around $40, where as in the U.S. the same meal would cost $100+. What’s the absolute best part of living in Mexico City? “Overall, what I love the most about living here is the ability to really enjoy my life. I wake up rested, have leisurely mornings, explore neighborhoods, eat at tons of different restaurants, enjoy afternoon drinks at rooftop bars, and travel, all on a reasonable salary. The lifestyle here is just much more relaxed and there’s a heavy emphasis on relationships, too.